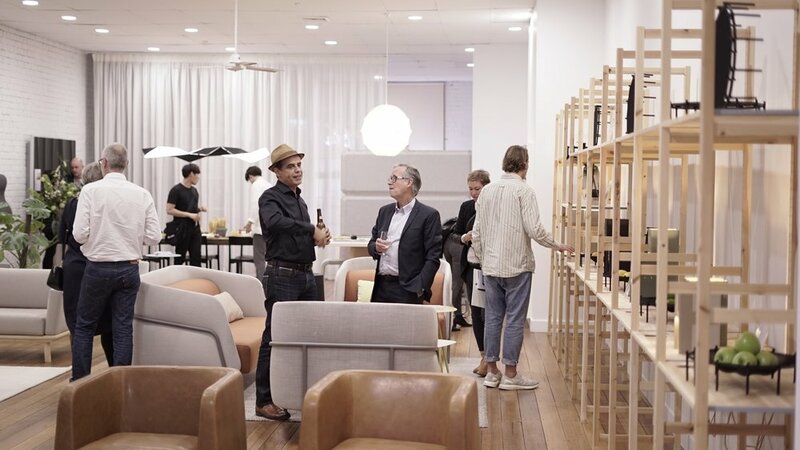 Last week, we celebrated the opening night of 'Decoding Design' as part of Melbourne Design Week 2018. Here we would like to share with you the evening, all the the exciting things that happened and the people who were involved. We are always striving towards creating a positive impact on our environment, so each year we look for new ways to contribute and collaborate with other members of our community who share these values. We have been inspired by Melbourne Design Week’s contributions towards design education since its founding, so this year KFive+Kinnarps jumped at the chance to make our own mark on this amazing week in Melbourne. We embraced the role of creating opportunities for broad audiences to experience contemporary design. KFive wanted to provide the chance for the Victorian design community to come together to discuss design and bring together people, ideas and experiences. We were delighted when we discovered the opportunity to collaborate with ‘Decoding Design’. Decoding Design represents three designers, three nationalities, three cultures and three design disciplines. Yan Huang, Chinese Automotive Designer, Manuel Canestrini, German Architect and Ilan El, Israeli Industrial Designer, interpret archetypical and traditional items of their fellow cultures in their own way. Similarly, KFive are proud to be an incredibly diverse team and so we felt extremely connected to the themes of this exhibition which explored how cross-cultural preconceived ideas affect our expectations. Each individual designer investigate a cultural perception by creating a new interpretive object. ILAN EL is Melbourne based Industrial Designer. Originally from Israel, Ilan is the founder of Ilanel Design Studio. established in 2010, Ilanel’s creations can now be seen around the world. From bespoke lighting in high-end residential projects to large scale commercial and hospitality installations. YAN HUANG is Melbourne based Automotive Designer. Originally from China, Yan is the founder of YanDesign Studio. YanDesign studio is an Australian company dedicated to create products with simplicity and style. They specialise in the design and production of bespoke furniture. MANUEL CANESTRINI is an architect by trade and industrial designer by heart. Born and raised in Germany it comes as no surprise that his designs are influenced by German Bauhaus aesthetics as well as efficient production methods. Manuel is the founder of manuel canestrini creative offering interior and product design. He calls Australia home since 2006 and has worked as an architectural, interior and product designer for over 20 years in Germany and all over Australia.